Every now and then I pull out my waffle maker and make the kids a big old batch of waffles. It is so awesome that I can make these for myself at the same time. 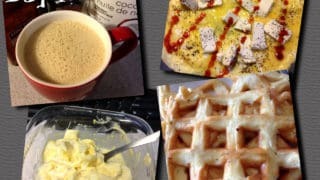 Keto Waffles with no nut flours, is it possible? 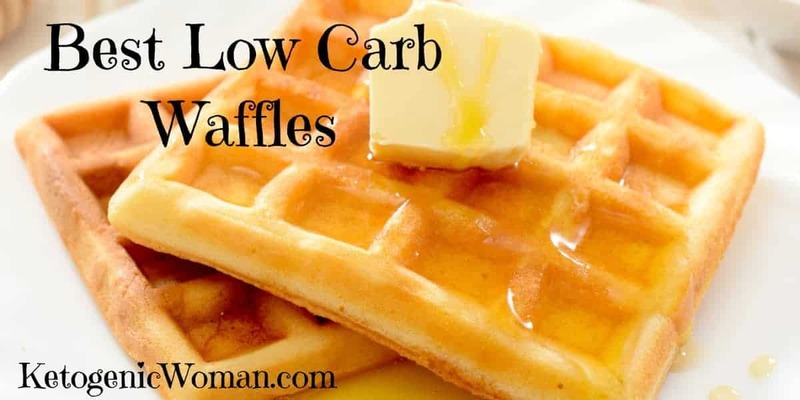 These low carb waffles are not only low carb, they are practically no carb! There are no fancy ingredients like coconut flour or ground up this and that. 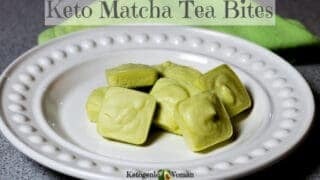 And this is way cheaper and easier and healthier than a low carb waffle mix. All you need is eggs and cream cheese! Honestly, that is it. Plus whatever you want to top it with. They can be made in advance and then popped in the toaster to make them crispy. You could also use the waffles as bread to hold a fried egg sandwich or a low carb BLT. The idea originated from the famous cream cheese pancake recipe on this blog. I have modified that recipe for all kinds of things and I just find it simpler than using a premade low carb pancake mix. Those never taste very good anyways and have so many ingredients we don’t need. 2 ounces cream cheese (from a brick) OR 2 tbsp mayo or coconut oil if you are trying to cut back on cheese. 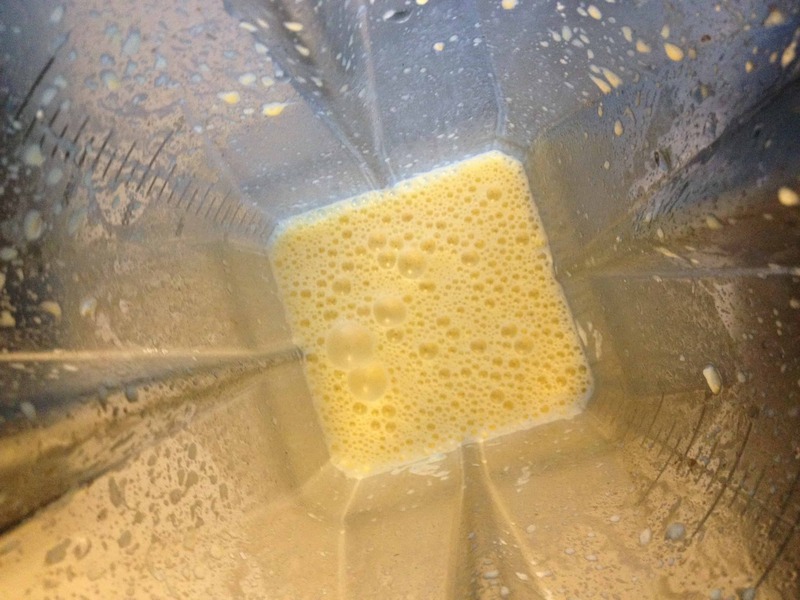 In your blender or Magic Bullet, toss in the eggs and cream cheese. I didn’t bother to bring anything to room temperature. You will need to let the batter rest for a few moments. This is when I get out the waffle maker and preheat it for 5 minutes. NOTE: To make these fluffy like in my picture at the top, blend everything except for the egg whites. Beat the egg whites until stiff peaks form and then gently fold the egg whites into the mixture that you have blended. It’s more work so I rarely do it, but there it is! Once the waffle maker is hot, pour the entire batch into the waffle maker. This will of course depend on the size, I have a big cuisinart waffle maker. If your waffle maker is small, adjust accordingly. Close the lid and wait until you no longer see any steam (about 5 minutes). Put on a plate and top them up! They won’t come out crispy like regular waffles. However, they crisp up very nicely in my toaster oven, so you can make lots of these in advance and toast them as you need them. That said, there is a way to make them a little crispier. Substitute 1 ounce of the cream cheese for 1 tbsp melted coconut oil. This bit of extra crispiness is only noticeable when eaten fresh from the waffle maker. These make a great low carb or Keto dessert like my Raspberry Crepes , top them with berries and unsweetened whip cream. If you are following the Egg Fast, you can use these as bread for fried egg sandwiches or even make grilled cheese sandwiches. See Egg Fast Menu Day 2. For the Egg Fast, the entire recipe counts as 2 eggs and 2 ounces cheese (or 2 tbsp fat if you substituted mayo for the cream cheese). I found 1/2 the recipe to be very filling once I topped it with butter! What toppings can I use on these Keto Waffles? 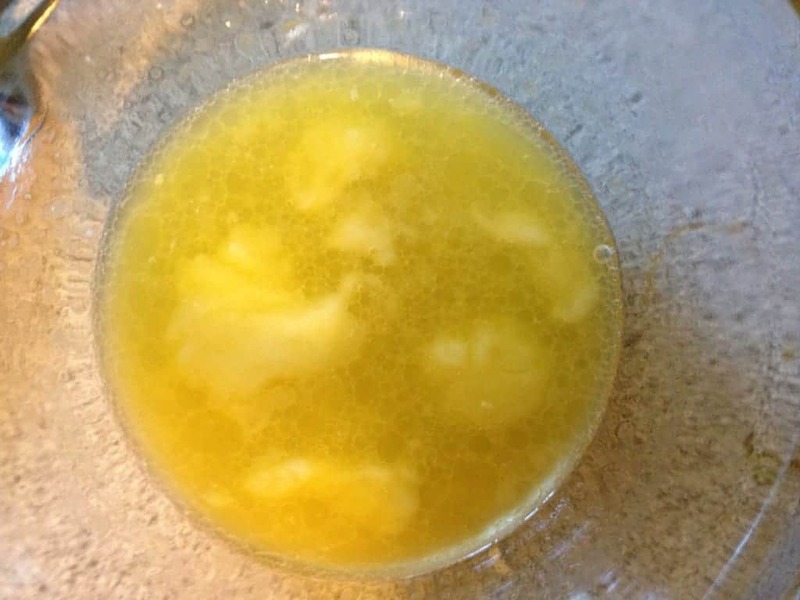 When doing the egg fast, the topping I usually make is simply this: I slightly melt 1 tbsp butter in a dish. Stir in 1 teaspoon of sugar free salted caramel syrup and drizzle over top the waffles. Heavenly! 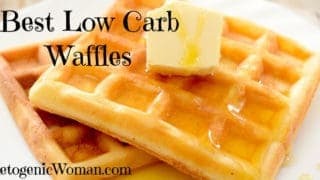 Why do I think this is the Best Low Carb Waffles Recipe? The recipe has only 2 ingredients! Fast and simple to make. Can be used for savory recipes as well as sweet desserts. Try my Keto Chocolate Chip Waffles here! 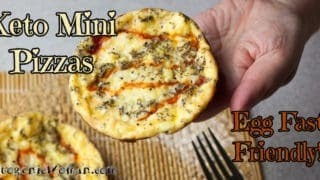 Looking for more Egg Fast recipes to get you through? Here are some basic egg fast recipes for you to try out! 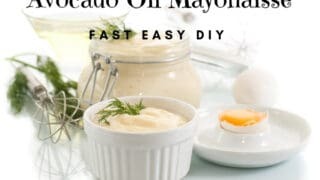 Easy Avocado Oil Mayonnaise Recipe So Delicious You Will Want it on Everything! How to go back to Keto and NOT gain back the weight. 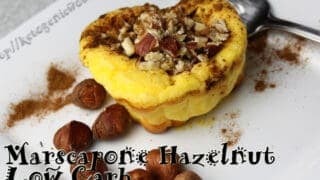 Tagged best low carb waffles recipe, low carb waffle mix, low carb waffle recipe, low carb waffles, low carb waffles recipe, no carb waffles. Bookmark the permalink. My eggs were on the smaller side so I whipped a third egg white and folded it in. There was barely wnough to cover the waffle iron (same as yours) and the resulting waffles were too thin. Next time I will double the ingredients. They did toast up nicely! I don’t use any sweeteners, so I added maple syrup extract to the batter and it added just the right mapley goodness to the dish. I served them with whipped cream and strawberries. Nom! Good idea about the maple extract! I always buy the extra large eggs so it probably makes a difference. Plus I beat my egg whites and fold them in which makes for more batter volume as well. Glad you tried them! These are the best Keto waffles!!! I am half way through a 3-day egg fast and these saved me from quitting. Thank you for sharing!!! Thanks for commenting! I have them even when not on the egg fast, I use the waffles to make toasted sandwiches! Same to you! Have a great Christmas! I love this recipe because the ingredients are easy to buy at any store to always have breakfast on hand! 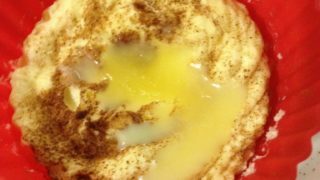 I hated ordering small packets of low carb pancake mix – its expensive and constantly needed to reorder so I was excited to hear about this simple recipe! I learned that you have to let the batter thicken for about 10 mins. It only makes a half waffle in my big Hamilton Beach waffle maker at an adequate thickness – which honestly is a perfect amount for breakfast but once I just focused on filling up half my waffle iron, I found the best consistency. You have to oil your waffle maker and add a splash of oil into the batter as well. I still find it a bit challenging to pull off the waffle maker as they dont crisp up. 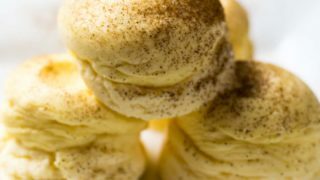 The consistency really is a lot like cream cheese texture – which is weird! But they taste great with sugar free syrup! Way better than eating eggs for breakfast but it takes some getting used to making them and eating them! I dont have a toaster oven so I dont know if that helps – i kinda want to get one so i can try it! They don’t get super crispy with the toaster oven, just enough! Thanks for the comments. Thanks for the suggestion of using mayo instead of cream cheese. I do not like getting a blender out and having more to wash so I just put two squirts of mayo and two eggs in a bowl and whipped it with a fork. It mixes so much better than cream cheese and I actually liked the taste better. I did not bother with my waffle iron and just made them as pancakes. The recipe made 3 medium sized pancakes. They were amazing, thanks! OMgosh great idea will try them for dinner tonight! Thank you for the pancake idea. I was wondering if you could make those. Getting the waffle iron out is a pain. I have been making these for the last 3 years, the only difference is that I add 1/4 tsp. baking powder and a splash of MCT oil so that they don’t stick in the waffle iron. I leave out the MCT oil if making pancakes. These are my favorite waffles/pancakes since doing Keto. OMG!! I just made this today, I was planning to make the waffels with it but that quickly changed my mind as soon as I tasted the recipe..I ended up making a German Pancake!! Doubled the recipe!! It was sooo Goood!! that’s great! So happy that you love it! Can I make pancakes with this recipe? I wonder if I could. 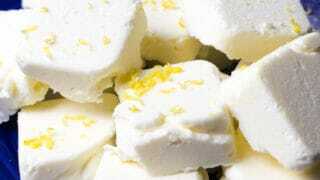 Have you tried whipping the egg whites first then mixing in rest of ingredients? I am wondering if this would help with runny texture people are complaining of in waffle iron. So happy you and your Mom liked them! So excited to try this! I need a waffle iron though, lol! Do you know (or anyone else know) if these would work in a silicone waffle maker that goes in the oven? I was thinking about ordering one, but wondering if a regular waffle iron is better for this? I’ve been eating Keto for almost a year and have lost 50 Lbs so far and have about 35 more to go. I’ve been stalled since Xmas though so I just joined the Facebook egg fast group (just waiting for approval from admin). I’m hoping to start cycling the egg fast with LCHF to break this stall and start losing again. 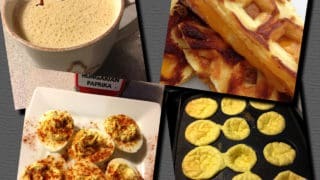 I’m loving your blog, recipes and egg fast info! Thanks for sharing! I have never tried that before but it could work. The same recipe also works as pancakes which are great too. Congrats on your weight loss so far! 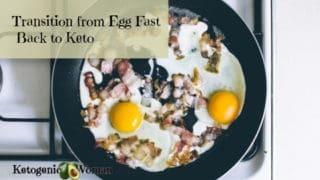 Many people do alternate between EF and keto with much success. Thanks! ? I just made the recipe as pancakes and they were awesome, so they will definitely be in rotation when I do the EF! Thank you, thank you, thank you!! I have added these to my low carb rotation and they are marvelous! I give them a quick pan fry with a pat of butter to crisp them and add some extra fat, then top with a thin smear of peanut butter and a syrup of water, sugar substitute, and pure vanilla. Someday I will actually make sandwiches and wraps but for now I am satisfying my peanut butter waffle craving, lol. These freeze beautifully, for anyone wondering. I wait for them to fully cool, then layer them with wax paper and seal them in a ziplock freezer bag. I reheat either in a pan with butter or in the toaster oven. They don’t last long enough for me to know for sure, but I’m a baker and most things with egg can be frozen for about a month. Another month or two if you’re using a deep freeze. Wow, thanks for the info about freezing them! Now I know I can make lots of extras on the weekend! These are probably the first low carb waffles I’ve eaten that actually taste like waffles! LOVE THESE and I’m looking forward to making a grilled cheese this afternoon with them as well. Thank you for your great recipes! SO happy you like them! The grilled cheese sandwiches are pretty awesome too, especially if you have a way to crisp them up like in a toaster oven or even in the waffle maker. We had waffles for dinner tonight with Wakden Farms Syrup. It was sooo easy and good. Thanks, glad you enjoyed them! I am on day 3 of my egg fast, using only eggs and butter. I am so pleasantly surprised to find your site! I want to run out and buy a waffle iron!!! I had no idea how creative and inventive you can be with eggs and simple ingredients. I’m in! haha, that’s awesome! The waffles and pancakes are a nice change from just eggs. Thanks so much for the recipe! I’m on day 3 of my first egg fast and I’m having these waffles again after having them on day 1. I like that I can make a double batch and have one with ‘syrup’ for breakfast and make a sandwich with the other. For the ‘syrup’, I didn’t have any maple extract/flavoring so I just melted a tbsp of butter and added a couple of drops of liquid stevia, some vanilla extract and a pinch of cinnamon and that worked great. The first time I used all cream cheese but today I swapped out 1 oz of cream cheese for 1 tbsp of mayo and they were just as good. I did this because I’m having a problem getting enough fat in and it also gives me the room to have a piece or two of cheese during the day. I wanted to share my experience with my waffle maker. I have a Waring Pro (the round one that flips over). The first batch I made, I put the whole batch in the waffle maker and it made a big mess. It looked like it fit but then is started expanding and running out the sides. I’ve found that, if I make a double batch, it makes 3 waffles perfectly. I pour a third of the double batch into the waffle maker and let it sit (open) for about 30 seconds. Then I close it and let it sit for another 30 seconds or so before flipping it over. This keeps it from running out the sides. They get nice and brown but I still put them in the toaster for a bit to get them a little crispier. I spray the waffle iron with coconut oil spray. Thank you for these tips! Also give them a try substituting coconut oil for the mayo! They have a slightly different texture that way as well. Hi there. So excited to try. How do you store them? Can you freeze them. I’d like to make enough to do the fast with as little prep as possible after day 1. I’ve actually never frozen these. I have made a large batch and kept in the fridge. They can be toasted and you can also make a grilled cheese wafflewich with them, or even a fried egg waffle sandwich. 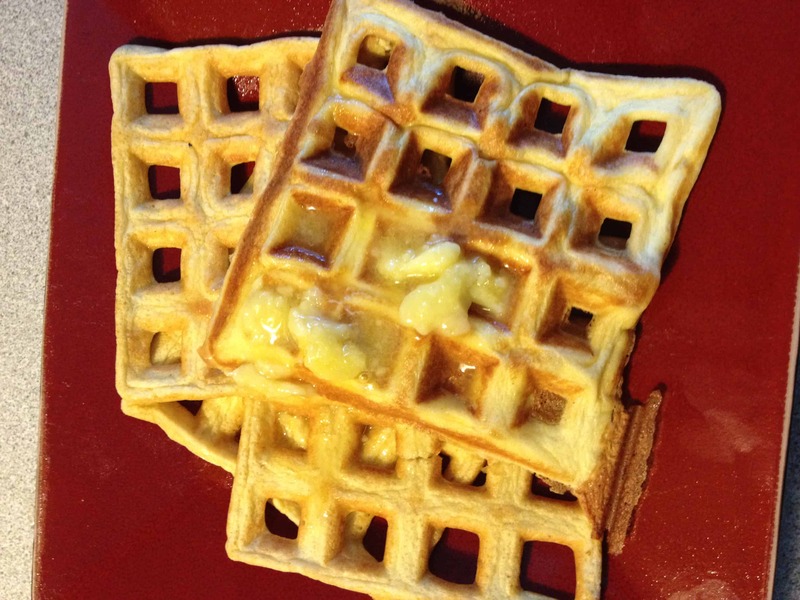 My husband and I went out last night and bought a waffle maker just so I could try this recipe (we also bought a cast iron griddle so we could make grilled cheese sandwiches with the waffles). I ended up having to triple the recipe because my husband wanted two sandwiches. And because the first batch came out in pieces. I came out with six good-enough waffles and made grilled cheese sammies. They were so delicious! This morning, I heated up the broken pieces from last night and drizzled them with butter/sugar free pancake syrup. I will be making these often! So so so yummy! 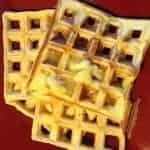 Just had a warm snickers natural crunchy peanut butter sandwich with these waffles. So delicious. Thanks for the recipe!! haha, you gave me my Smile of the Day! I was trying to think how to politely respond to your Snickers comment and then this came. Phew! It was so delicious! I appreciate a recipe that actually tastes good!! 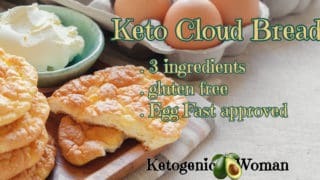 I have never had success with fat bomb recipes, cloud bread and treats made with almond and coconut flours-and I am a good cook who loves to experiment in the kitchen!! I made more waffles yesterday and added low sugar jam for a total of 14 carbs. So satisfying. I am having to adjust the amount of batter I pour in the waffle maker as I did have significant overflow the first time. The batter puffs up and responds so well to the heat of the waffle maker so today I am using a different one to see if I can avoid the oozing I had with the smaller waffle maker. Other than some clean up time, this was easy and delicious. Thanks again! Remember the rule…Smuckers not Snickers? Happy that you are enjoying the recipe! I read in a FB group the other day that someone used coconut oil instead of cream cheese and the waffles turned out nice and firm. I am going to try that this weekend! Did you count peanut butter as your fats for your waffle? The waffles came out very crisp! YUM! The addition of flax was genuis! The texture was great. Add a couple of drops of maple extract for really nice flavor! Wow mine came out perfact . Ionly add a pinch of baking powder.. I will make more . Thank you ! That’s great, happy to hear it! They are a nice change! How much baking powder did you use? I have not had that issue so I’m not even sure what to suggest. Other than maybe wiping the waffle iron down with some oil before using? I haven’t had to do that, just a suggestion. Thanks, maybe I’ll try that next time. Or maybe I’ll just stick with making pancakes – very yummy that way. Can you post the macros for the waffles. I log my meals on My Fitness Pal. Thanks for the recipe these waffles are delicious. Hi, I don’t know what the macros are because I don’t really track those anymore. But this one is super easy, if you are using My Fitness Pal, just enter 2 eggs and 2 ounces cream cheese and it will figure out the macros for you. And I’m glad that you like them! Thanks for this recipe. Starting day 3 of an egg fast tomorrow and now I have breakfast! Janice, you can get an add on for your browser that will calculate all of the percentages for each meal, including net carbs, in MFP. I use it. Just search MFP keto script. I find it very handy. Whoa! Just had these for dinner and they’re now officially my go to snack! Added a tiny bit of stevia and cinnamon to the batter, waffle iron(ed), let them cool on a rack, then into the toaster. Then I took two tablespoons of butter and microwaved with a teaspoon of sugar free chocolate syrup that I put in my coffee. Heck yeah! So yummy. And great egg fast ratios. And this whole thing took about 10 minutes. 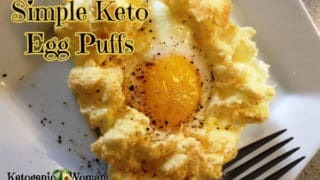 Thank you KetoWoman! I’m so happy you like them! Now I want them too! Tomorrow morning, yum! Well, they are mostly eggs so that is bound to be a factor. But it is the identical recipe to the pancakes so I don’t know, for me it really depends on if I’m in an ‘oh my god, no more eggs!’ mood or what. Try adding some cinnamon and vanilla extract to the mix and/or a sweetener. Try adding 1 tbsp flax to the mix. It makes them more bready. Adriana, do you grind up the flax? do you store these in the refrigerator or freezer when you make a bunch ahead of time? And, yum! I wasn’t even sure I still had a waffle iron it has been that long since I have used it, but this is going to have me using it a lot! Grilled cheese on these tonight for dinner while egg fasting! Yum!! I keep them in the fridge because I normally eat them within a couple days. I would be interested to hear if anyone freezes them though, could be useful! Thank you so much for the recipe! I made these for lunch and they were delish. Toasted them and used as a turkey-provolone sandwich. Perfect. Can’t wait to try breakfast sandwiches with this recipe. Yes, they do make a great ‘bread’ for grilled cheese or fried egg sandwiches. Glad you like them! 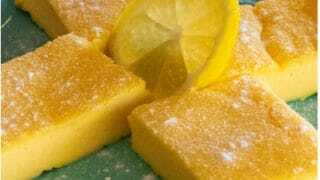 This recipe is delightful! I use it several times a week..and the Walden Farms syrup is equally brilliant! I have been low carb for 13 years now, and this taste is like Heaven in my mouth!! I made this waffle recipe in my sandwich maker and it made perfect triangles for a grilled cheese sandwich. When not on the egg fast I add a tablespoon of almond flour to the batter and it makes for a really nice low carb “bread” which I use for BLT’s, ham & swiss, and any other time I need something for a sandwich. Ya, those sugar free syrups can be an issue. Some people are more sensitive to them than others. In theory they are zero carbs. What I do is take a tablespoon and mix it into melted butter, it goes a long way and tastes great with the waffles. 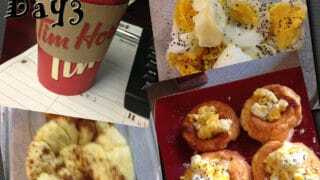 You can also take the waffles and use them as bread for fried eggs or even a grilled cheese sandwich. EGG-xactly! haha! Thank you so much for all your info in this site. You have helped me break through my 2 yr stall. We did Insanity 6 days a week (and still love it) and I did the Shakeology but nothing was breaking through my plateau of 166. I’m nearly 46, 5’5″ and I thought, “This is it. It must just be my age and body type now.” Depressing thought for someone who has been really skinny most of my life. So I can’t say enough. You’re an inspiration and I thank you. oh wow, thanks so much for your kind words! I’m so happy but you did the work, you applied yourself to it and you did it! Would this batter work as pancakes?! Yes, they work as pancakes. They will be thin pancakes but beating the egg whites first until fluffy might fix that. Sounds like a great idea! These would be gluten-free, right? Could be a great bread replacement. Pinning and G+ and tweeting. Yes, they are gluten free as well! As much as I love waffles I need to tape this recipe to the refrigerator. You did great on that 8 week challenge! But I do feel best on low carb, and Keto is basically low carbs and healthy fats. Great that you are continuing with the workouts! Another thought I just had: salami slices in a waffle iron. Prosciutto in a waffle iron. Lord help me–this is why I no longer own a waffle iron. When you get done playin’ with the waffle maker, then you can drag out your doughnut pan (assuming you have one) and make meat doughnts or bagels. My favorite is a muffin-less Sausage Egg McMuffin thingie using sausage as the bagel (or muffin, in this case), with a fried egg and cheese in the center. Yeah, the bagels end up flat on the tops, but once you turn then over, rounded ends appear. The flat sides end up on the inside of your sandwich, so it doesn’t matter. And they say a zero-carb diet is boring…HA! wow, you have some awesome ideas here! YOU should have a recipe site too! I’m going to try some of these. Have you ever considered making meat waffles (with ground meat), or throwing a thin steak-type piece of meat on your waffle iron to cook? Just curious. I bet the steak would look cool with all those little squares in it. I’m thinking pork sausage waffles would be AWESOME! The interactions of the fat with the squares would be a marriage made in Heaven! I found a large andouille sausage in my freezer this morning. I think I’ll remove it from the casung and give it a try while my waffle iron is still on the counter.